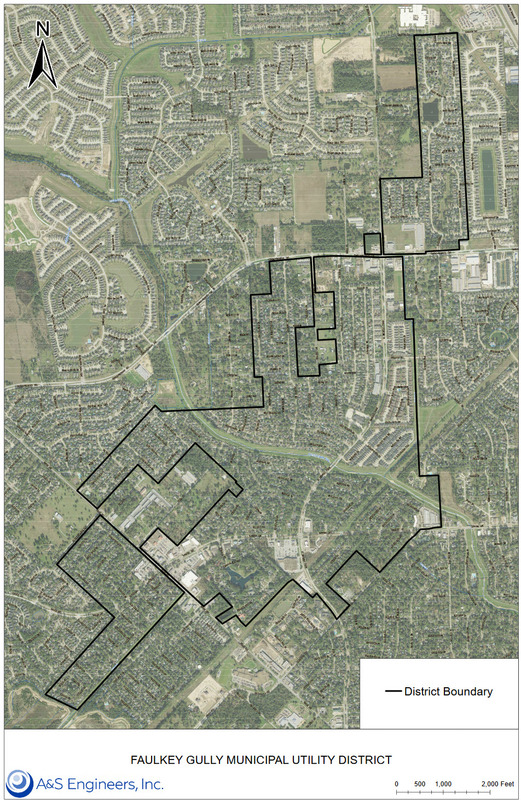 Faulkey Gully Municipal Utility District (Faulkey Gully MUD or the “District”), located in Harris County, was created on March 1, 1973, and confirmed at an election held within the District on January 5, 1974. The District was created by the Texas Water Commission, predecessor to the Texas Commission on Environmental Quality (TCEQ). The rights, powers, privileges, authority and functions of the District are established by the general laws of the State of Texas pertaining to municipal utility districts, including particularly Charters 49 and 54, Texas Water Code, as amended. The District is subject to the continuing supervision of the TCEQ. The District is empowered to purchase, construct, operate and maintain all works, improvements, facilities and plants necessary for the supply of water, the collection, transportation and treatment of wastewater, and the control and diversion of storm water. The District has the authority and responsibility to issue bonds as necessary, collect taxes, and set water and sanitary sewer rates and related rates. Click here to view a larger PDF of the District’s map.